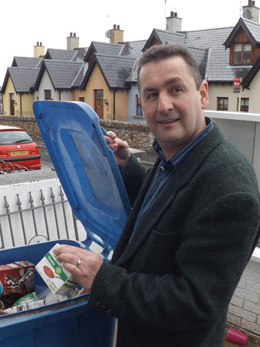 Councillor Willie Clarke pops a tetra pack into the blue bin. Sinn Féin Newcastle area C0uncillor Willie Clarke has welcomed the announcement that residents in Down District can now recycle beverage cartons in their blue bin. Cllr Clarke said: “I am really pleased that our residents will now be able to recycle Tetra Paks in a more convenient way as it has been frustrating that the Blue bin has excluded many items that can be recycled. “This new service will help us to increase the amount of household waste recycled from the Down District area, lessen disposal costs, enable us to continue to mitigate harmful greenhouse gas emissions and allows us to provide a more appropriate service and better value for local residents. “The types of cartons that are now accepted in the blue bin include food and drinks cartons, beverage cartons and cartons such as those known as Tetra Packs. “These are widely used to package milk, fruit juice and an increasingly wide range of food products, including soup, chopped tomatoes and pulses”.